Synopsis: Psh, you know what this is about. Responsibility and what not. It seems that at this point, any time that a superhero movie comes out, it's carrying a lot of baggage that makes it pretty strange to review in only one context. THE AVENGERS was the culmination of five years, and at least to me, three movies that allowed this wonderful experiment to happen. As a stand-alone movie, it's still good but it needed work. THE DARK KNIGHT RISES is also pretty loaded as it is the last movie in the hugely popular Nolan Batman series and because nerds on the internet decided that THE AVENGERS and Batman are in some sort of box-office race, the financial performance will be the biggest source of talk when the movie comes out. Then THE AMAZING SPIDER-MAN has the baggage that it's a reboot of a movie franchise that started a decade ago and ended only five years ago. Let me be upfront here, I'm not the biggest fan of a reboot in this particular instance because I just really want superhero franchises to be going forward and exploring some of the bigger story lines in their canon. With Spider-Man for example, there are some of the mid 90's story lines that I wish would actually be brought to life in the big screen. For example any of the Venom story lines (done right), or even the Maximum Carnage stories feel like they would work out well. But since that can't be helped, I tried to be as open as I could be about the movie. So contextualizing the review is a little difficult. As a movie in general, THE AMAZING SPIDER-MAN is good looking movie that is not entirely supported by the script. To start off, damn I wish that Andrew Garfield had been the original Peter Parker and that Emma Stone was cast in the original series as well. They were probably the best part of the movie. Even if their relationship's portrayal left a lot to be desired, their chemistry was completely undeniable. I felt it in my gut. I got over Andrew Garfield's "emo"/hipster thing pretty quickly and was able to just enjoy his very teary-eyed performance as Peter as kind of a messed up kid going through stuff. He comes off a whiny kid, but I really liked that, because let's face it, we were all like that, radioactive spider or not. I found the way that he is portrayed to be pretty interesting where Peter doesn't come off as a lame nerd, but more antisocial, and just a bit of an outcast. If anything, the kid that he stole ideas from about web swinging techniques from are the bigger dorks than him. Which brings me along to another point, where Peter isn't a total nerd, but he doesn't seem to be too much into school. At least not in any way that was shown in the movie. I don't quite understand how smart he really is supposed to be. You see in a very strange scene that he built some wireless door lock, and he talks a little bit about genetics, but that's all you see about how smart he is. I'm sure that it took him a little longer than usual to figure out how to make his web shooters. But I guess getting bit gives you smart spider brains, huh? Going back to the other lead, the lovely Emma Stone, can she just be in everything ever? I know she's not perfect as Zooey Deschanel, but her mannerisms and quirks (not the Wes Anderson type) always adds some lighthearted and tenderness to many crucial moments in the movie. As I write this, I realize that her lightheartedness is needed in a movie that is, for all senses and purposes, a pretty dark movie. One of the things I was a bit skeptical about at first was the casting of Rhys Ifans as Lizard, which turned out well when the character made sense. My biggest complaint about him is the his reason for turning into a crazy and evil mutant. Initially, you feel for his frustrations and motivations for wanting to continue his experiments. I see he got from point A to point C, but I don't know how he got there. I also loved Martin Sheen and Sally Field as Uncle Ben and Aunt May, and they actually felt like characters instead of plot points. Director Marc Webb does a fantastic job of transitioning from indie-comedies to a big budget action movie. I'm still not sure exactly what Sony wanted with the director, maybe it was the cheaper rate or the fact that he can do romance well. I am going to attribute the Peter and Gwen's relationship to him, at least the part that works. In addition, I want to give major props to the fight choreographers. They really thought of some creative ways for Spidey to move around and how to fight all of his enemies. I'm not sure if this was one a situation where they felt like they had to up the ante as compared to the previous movies, but Spidey's use of the web was also pretty fun. He uses them as a way to slingshot himself. As a nerdy plus, I thoroughly enjoyed how they showed exactly where Spidey was swinging from. If I remember correctly, in the movies and in the comics, they never really show where the web is sticking to. My big complain about the film isn't as much as what it is but what it could have been, and I know that's sometimes a lame excuse but hear me out. I personally have no issue with remakes as long as they are good. For example, LET THE RIGHT ONE IN and LET ME IN is perfectly good example of when a remake takes the original and then does something original with it. It's actually strange because I enjoy LET ME IN more than the original Swedish movie. Then you have other remakes like, REC and QUARANTINE, where the latter is a shot-for-shot remake is a complete waste of time. I guess my point is that if we're going to remake a franchise that ended five years ago, let's give people a reason to come back. This movie tried but then seems to be scared to deviate from the comics too much, and then became just a strange retelling of the movie. It actually really bothers me how the storyline related to the parents became completely forgotten and dismissed. Not only that, but you know by the end of the movie that somehow their disappearance is going to come into place in the next two movies or at the very least, just the second movie. Media critic Peter Gutierrez, who writes in at his blog Connect The Pop, commented to me on Twitter that he thought that Peter, as a character, was a combination of the influence of his own father, Uncle Ben, Dr. Connors, and Mr. Stacy. That makes a whole lot of sense when you take into consideration how all of their actions make Peter into the Spider-Man we know. Richard gave Peter the interest in science that allow him to build his web shooter. Uncle Ben taught Peter hard work and responsibility. Dr. Connors showed Peter the consequences of our actions. And Mr. Stacy taught Peter about the fact that good intentions don't always bring about good results. The reason I mention this is because this particular theme would have worked out so much better if Richard Parker's disappearance would have been explained and not just left to a sequel. I think what might be an even more mishandled plot point is the way that Uncle Ben's death was handled. It's strange, while I feel that the the character was better developed in a way that should have given, his eventual murder some good emotional weight, but I ended up feeling a little bit cold. Then you see the way that Peter reacts to it, and you kind of realize he missed the point of the teachings Ben was trying to instill into him. What's really strange to me is why they decided to drop the storyline of Peter finding the killer. I'm not sure why this was, and I was hoping that there would have been some sort of emotional pay off or catharsis by him finding the killer. There are reasons that people have speculated why he drops his search for the killer, but it doesn't come off that way in the movie. This isn't PROMETHEUS, where we don't have to do a lot of the screenwriter's work. Another issue I had was the leap that Dr. Connors took from being a guy that, as I mentioned before, had good motivations to do what he does and that just wants to finish his research and maybe grown an arm to a crazy evil mutant. I get his motivation and how it could be distorted to be something more malevolent, but my problem was the how the movie got there was very strange. Overall, THE AMAZING SPIDER-MAN is a good movie that had the good fortune of having some great casting and some good action. As I mentioned before, I loved the hell out of the leads. Their chemistry and relationship was fun to watch. The problem is that the movie sort of falls apart in the third act for me. The action is swell and everything, but the way that some of the characters act is just bizarre to me. Now, I know it sounds super negative, but I'm not going to lie when I say, I actually need to rewatch the first movie to see how it stacks up against this one. There are a lot of great things about the movie. It's one of those movies that really is good, but maybe it's just really there isn't enough to make it truly great. To continue with the trend I started in my last review, I'm going to link someone's review that differs vastly from mine. 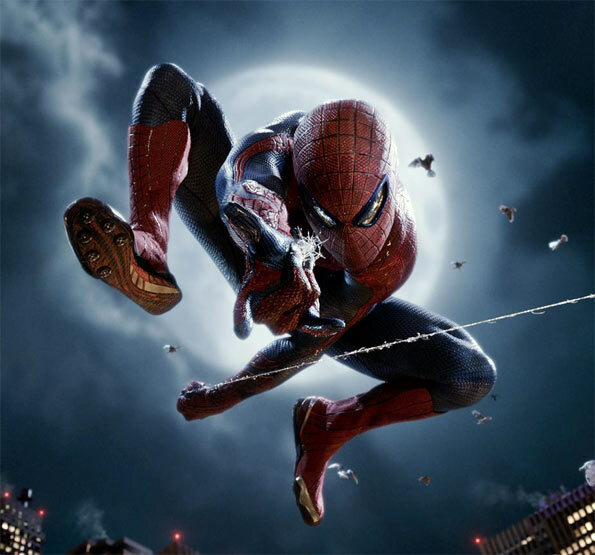 In this case, we have friend of the blog JC DeLeon's review of THE AMAZING SPIDER-MAN for Screen Invasion, which you can find here.